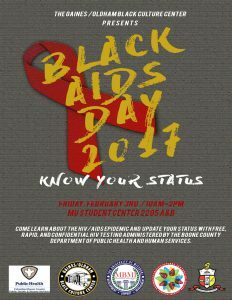 One in six Black Americans name HIV/AIDS as the number one health problem in the U.S. . Come out to Black AIDS Day 2017 and learn about the HIV/AIDS epidemic and update your status with free, rapid, and confidential HIV testing administered by the Boone County Department of Public Health and Human Services. The event is on Friday, February 3rd from 10am-2pm in the Student Center Room 2205 A & B.